How to take photographs of moon using a normal DSLR? I learn something new every time I go out with my DSLR camera to do photography. An ultra wide angle lens is a part of my gear now, and I have experimented a lot with it in the last couple of days. The motivation behind this post is my most recent work doing night photography including moon and stars. It required a fair amount of dabbling with camera settings and post-production work too. If you have ever wondered how to take pictures of our planet's natural satellite, this post will walk you through each and every step. Let's get started. Any APS-C or full frame DSLR camera. You don't need a fancy full frame or high fps camera. White balance: Auto if shooting RAW. Aperture: Somewhere between f8- f12. Bracketing: Not necessary though, but you can take 3-4 different shots with varying shutter speed. 1) Attach the telephoto lens to your DSLR and turn the power on. 2) Set up your DSLR on a stable surface using a really sturdy tripod. 3) Point it to the moon and zoom your lens to its maximum focal length. Look through the viewfinder if you can see the moon. 4) Turn on live view and magnify 10x times. 5) In manual focus mode, try to adjust the focus on the moon by rotating the focus ring on the lens. This takes a lot of patience as the camera shake is really strong since we are zoomed all the way in. 7) Once focus is set up, adjust the shutter speed for proper exposure. I am happy with a single shot for now, but you can try 3-4 bracketed shots as well. 8) Take a picture of some other interesting subject such as highway light trails, a person or a tree to act as foreground. This would add so much more interest to the photograph and make it stand out a lot. 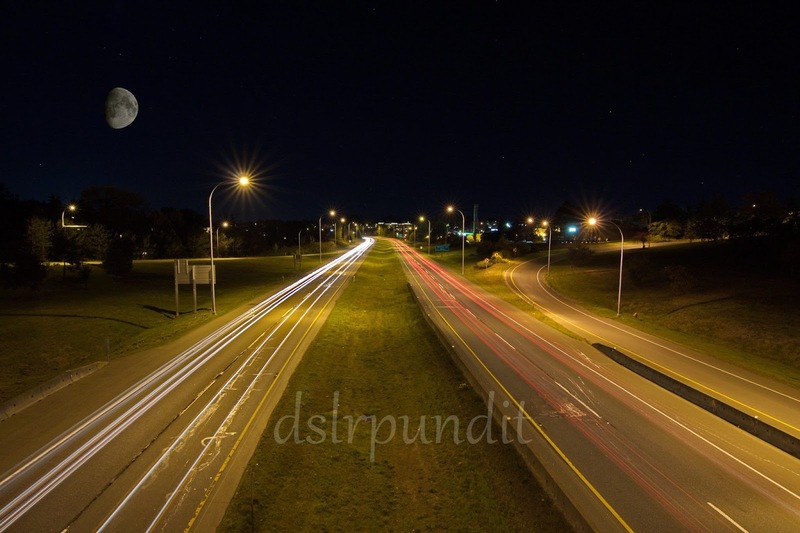 For me, I took an image of highway using wide angle lens with an exposure time of 30 seconds. F11, 100 ISO 30 seconds. Good article. Very nice pic of the Moon. Thank you very much, glad it was useful.